Here is a strategy for the position trader called trading the Ichimoku cloud. You may hear people talk about trading the cloud. They’re referring to Ichimoku clouds (short for Ichimoku Kinko Hyo, which translates to “one-glance equilibrium chart”). It’s a moving average–based trend identification system composed of five different lines, two of which form the system’s main component, the cloud. Ichimoku analysis is primarily longer term and best utilized on daily or weekly charts. In addition to assisting in detecting trends, the components of the system are also very useful in identifying key levels of support and resistance. A unique feature of the cloud is that it factors in time as well as price, because the cloud is projected several periods outs. The Ichimoku approach was developed in the 1930s in Japan by Goichi Hosoda, a Japanese journalist. Hosoda spent 30 years developing his idea before releasing his findings to the public in the 1960s. Despite the numerous components of the system, the approach is easy to understand and follow (there is a reason why it’s named the “one-glance” chart). Furthermore, Ichimoku can be used for all liquid financial markets. Here, the components and derivations of the Ichimoku system are covered, and you find out how signals of varying degrees of strength are formed. The Ichimoku chart contains five different lines with both a Japanese name and an English name that can be used interchangeably. The lines are modified moving averages because they’re calculated by using highs and lows rather than closing prices. These lines are overlaid on a price chart so that prices can be viewed in relation to the Ichimoku chart, allowing you to quickly and easily identify a trend, as well as key support and resistance levels. The numbers 9, 26, and 52 are used in the traditional approach. In the past, a trading week in Japan was six days (one week minus Saturday). So, 9 represents a week and a half, 26 is the typical number of trading days in a month (30 days minus 4 Saturdays), and 52 is used to represent two months of trading days. Ichimoku’s most prominent feature, the cloud (kumo), is formed by leading spans 1 and 2. The space between the two lines creates the Ichimoku cloud. There are a number of ways that signals can be formed using an Ichimoku chart. The most common method is to look at the price position relative to the cloud, also referred to as the simple form. A break above the cloud is viewed as a bullish signal, and a break below is seen as bearish. Price movement that is contained within the cloud shows a consolidation and, therefore, no clear trend. 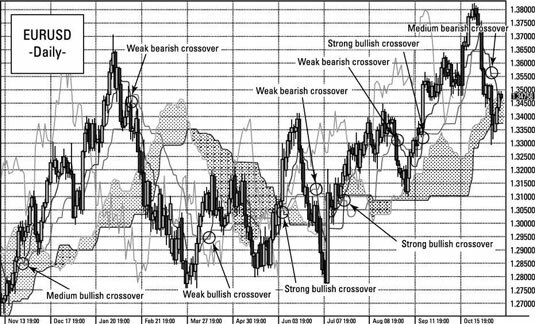 Crossovers of the conversion (tenkan) and base (kijun) lines generate what are referred to as main form signals. This is similar to the typical moving average crossover where a faster moving average (the conversion line) crosses a slower moving average (the base line). The figure shows you how to trade EUR/USD using Ichimoku clouds. As you can see, this is a slightly longer-term chart — it’s a daily chart, because this strategy can favor traders who prefer a slightly longer time frame.